I tend to be a creature of habit. I like to do things the usual or “normal” ways. I color inside the lines. I like clothes in classic styles that match easily. I prefer using tried and true recipes or simply adapting an existing recipe rather than creating my own from scratch. It shouldn’t surprise you, then, to know that I use my sourdough starter for making (what else?) bread. Just bread. How much I’ve missed by believing that sourdough is only good for bread baking! It IS wonderful for making bread. I love the mildly sour taste, the beauty of being able to skip the yeast, knowing that the phytic acid in my grains is sufficiently dealt with, the sheer frugality of sourdough, and the moist, chewy texture that it results in. Were you aware that the illustrious benefits of sourdough are not limited to bread or bread-like (buns, baguettes, etc.) baking? I wasn’t. I had heard that some people made sourdough pancakes, and I thought that was a nifty idea, but I never bothered. Stuck in my ways, head in the sand, I continued on with my bread-making ways until I began to explore the Sourdough eCourse put out by GNOWFGLINS this summer. My, how much I have to learn! And learning is exactly what I have been doing this past month. I began by making a brand new starter since I killed my previous starter when we moved this summer. 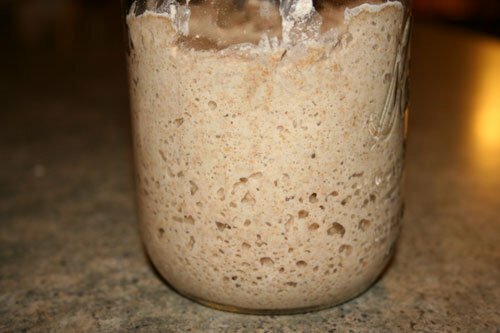 Using the detailed instructions and tutorials, I managed to make what just might be the best starter I have ever made. I used rye flour, although you can use wheat, spelt or even kamut if you like. Mine is incredibly bubbly and active, rises extremely well and began working for me within 5 days of starting it. You’ve probably heard of Artisan Bread in 5 Minutes a Day. I’ve been eyeing the books ever since they came out, and have even tried it multiple times, but I just couldn’t get over the nagging worries that the method couldn’t sufficiently deal with phytates in the whole grains. That, and the fact that by the second loaf, a yeasty taste and smell began to permeate each loaf and we just didn’t really enjoy the end result. I had so much fun watching the videos for this No-Knead Sourdough Bread (adapted from Artisan Bread in 5 Minutes) with my daughter, and watching Wardeh and her friend turn out wonderful product after product with one simply-made batch of no-knead dough that took 5 minutes to make (before sitting overnight). Large and small loaves of bread, buns, English muffins, cinnamon rolls, even pita bread! Was there no end to its uses? I had to try it myself. On my very first attempt, I made cinnamon rolls, buns and two loaves of bread. The rolls were soft and chewy, and not nearly as sour as I expected them to be (which the sweet topping made up for). My husband said the buns that we ate with our soup were among the best I’ve ever made– very moist, chewy and delicious. The bread was a piece of cake with the remaining dough, and was promptly frozen for when I go out of town and leave hubby and the kids to fend for themselves. If it tastes anything like the buns, it will be a hit. Best of all for this busy mama? For each new baking project, the dough was already made and all I had to do was heat my oven, shape the dough (and season, if necessary), and bake it. Truly, 5 minute baking, but with a nourishing outcome! Normally when I set out to make crepes, pancakes or waffles, I have to start the afternoon or evening before to allow sufficient soaking time. This recipe allowed me to use my sourdough starter as the basis of my batter, adding eggs, milk, salt and oil. It took only 5 minutes that morning to have my batter ready and my pans warmed up! I had a few problems with my crepes tearing, but I think it may have had to do with making my crepes just a little too thin and having a few sticking issues on my cast iron pan. 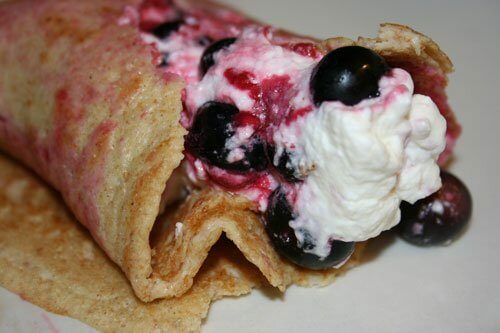 When I used my Earth Chef pan with ceramic, non-stick coating, my crepes came off easily. Nonetheless, even the ripped ones were promptly devoured, once covered by berries and whipped cream! They’re really very simple and easy to make. They’re just plain tasty- I love the mild sourdough tang! 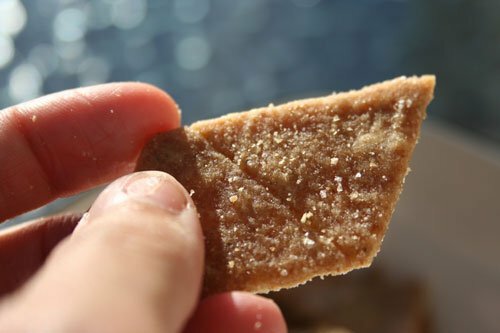 The specific directions helped me to make the perfect thin, crunchy cracker texture. I used Katie’s Crispy Sourdough Cracker Recipe. I added a bit of salt, garlic and onion powder, and some Italian seasoning. Though you only need to wait 7 hours, I sort of forgot about my dough and left it a full 24 hours before I got around to baking them. I thought I was in for some very sour and possibly inedible crackers, but I was wrong. This recipe must be forgiving, because they turned out just fine, and we wolfed down 1/3 of them within less than 2 hours of taking them out of the oven. I’ll take that as a good sign that everyone is enjoying them. There’s a whole lot more to sourdough than meets the eye. My previous perceptions have been shattered and I now realize just how easy and versatile sourdough really is! Want to learn more about how you can use sourdough to make all manner of nourishing and delicious baked goods? Sign up for the “Pay What You Can” Sourdough eCourse, where you will receive a lifetime membership and access to all videos and resources! What is your favorite thing about sourdough and what sorts of wonderful and unusual things do you like to make with it? A lesson in making sourdough bread for y'all! Wow! I just finished some blog posts on sourdough last week. I also have heard of sourdough pancakes, but never tried them. 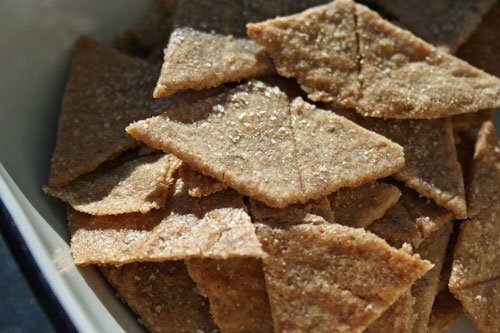 Crackers, pita, cinnamon rolls… I think I will have to check this all out! Very nice and well written post on the Sourdough E course Stephanie :D!! I have also been enjoying Wardeh’s course. I love her style and presentation and of course her blog. Among our favorites are biscuits, pancakes, cinnamon rolls (my 3 yr. old calls them rollings) and pita. In fact, I’ll be baking pita all afternoon to sell at my local Weston Price chapter meeting. I also turned my sourdough into Hot Cross Buns for an Easter treat. LOVE sourdough! Want to try the crackers and crepes–those sound yummy as well. @Ann, I am definitely planning to try the pita soon! How fun that you sell it at your WP meetings! I keep wanting to try sourdough. Well, I did try it once…but the starter didn’t even work right. I have had some more energy lately (yay!!!) and so maybe this could be something I try over the winter. I don’t get it though…the e-course for sourdough starts anytime? @Nola, Yes, it starts any time. Basically each person starts going through the course whenever they choose to enroll, which is nice because you aren’t restricted to starting on a particular date. HOORAY!!! I am also working my way through Wardeh’s sourdough ecourse right now and I can’t even believe how incredibly easy it all is. I haven’t tried the “bucket method” yet, but it’s on the list of things I can’t wait to try. This is on my list of things to try (again): sourdough. But I’m loving my sprouted flour and my first couple of attempts at sourdough were, ahem…not so good. lol. Someday, I will do it! Hi Stephanie! I have been following and love your blog, though this is the first time I’ve posted anything. This post convinced me to sign up for the ecourse…..and it really is amazing. I’m just starting out/learning the whole foods methods and this is such an encouraging and inspiring place to be. I can’t wait to try sourdough! As soon as we move next week I am joining Wardeh’s course and making a starter.